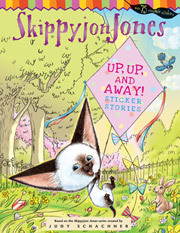 Skippyjon Jones: Up, Up and Away! Combine our bestselling Sticker Stories format with our bestselling character and say "¡Ay, caramba, mucho fun!" In this new adventure, Skippyjon Jones wants to celebrate spring by flying a kite, but discovers that using your imagination is even better when a rainy day forces him inside.